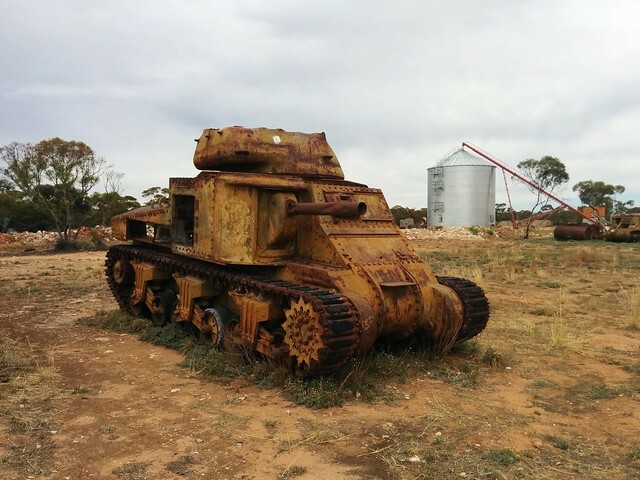 Driving along the Mallee Highway through rural Victoria back in 1982, I first discovered the Murrayville tank graveyard by accident when pulling over for a comfort stop. Murrayville is a sleepy, century-old wheat farming village built on a railway line between Pinaroo (SA) and Ouyen (Vic). Imagine my surprise when laid out in front of me were the rusting remains of what seemed like an entire armoured regiment. 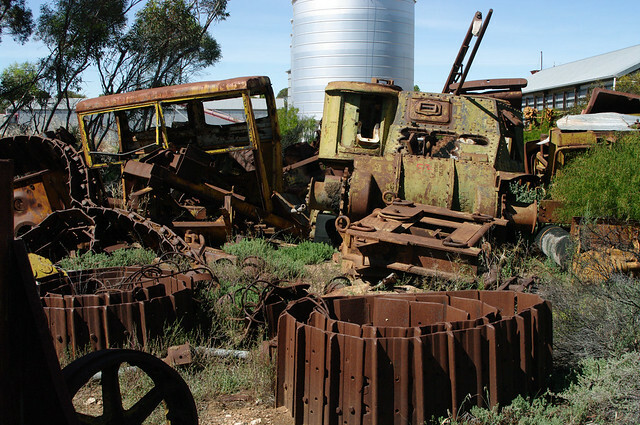 Among the piles of scrap metal, discarded farm machinery, old cars and trucks were several easily discernable WWII-era tanks. January 2016. With much of the lighter scraps cleared, this old M3 stands alone. The turret has been replaced recently. I counted at least six tanks; a couple of Matildas, another couple of Grants and another I like to believe was a Sherman. Most were in a sorry state with great chunks cut out of their hulls, turrets cast aside, engines and mechanicals stripped and tracks piled up under the trees. 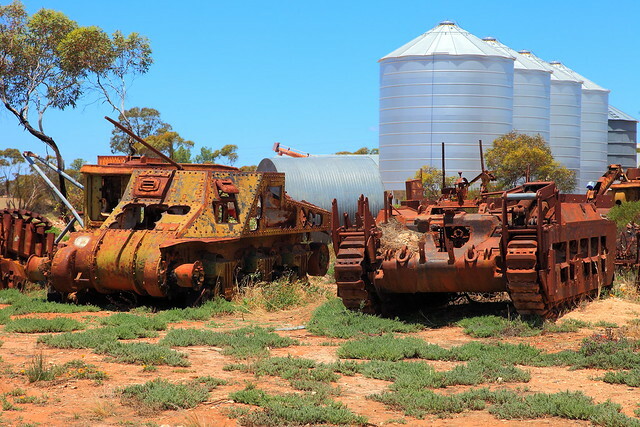 Just what the heck were these forlorn armoured vehicles doing out here in the bush, thousands of miles from the nearest battlefield or even army base? The earliest forms of the Internet were still a decade away, so I wrote to the Australian War Museum who, to my surprise and pleasure, wrote back. They informed me an enterprising local engineer had bought the surplus vehicles after the war in order to convert them for earthmoving and agricultural duties. A kind of ‘swords to ploughshares’ effort. At the time, none of the vehicles presented restoration prospects or even a source of spare parts. Complete units, the AWM informed me, were still available on the market for those who wanted one. How it looked before the site was "cleaned up"
I have made the drive through Murrayville countless times since and always made a point of popping by the old scrapyard to see what was happening to the tanks. Several years ago, most of the lighter metal scraps were removed and some of the hulls were bulldozed to make room for new buildings. At some point, someone had managed to roughly replace a turret on a sort-of complete Lee/Grant hull, shoving a length of drainpipe into the hole where the main gun once protruded. In this rapidly changing world, it's no surprise to learn that some of these remote townships struggle to stay viable. Passenger services on the railway have long since stopped and retail businesses struggle to keep their doors open. "We've often wanted to do something to make a feature in the town," Murrayville Museum & Heritage Society president, John Heintze told me over the phone, "but it's a constant struggle with bureaucracy to get anything done. After years of wrangling, we finally managed to get access to the old courthouse to expand the museum and we want to do something with the scout hall which is falling down, but we can't get permission for that. Red tape is our enemy here." I’ve also learned, thanks to the Internet, that the chap responsible for this was a much respected local called Peter Peers who passed away in 2010 at the ripe old age of 99. Apparently, the vehicles were sourced from Darwin and driven (somehow) on a six-week journey to Murrayville. * One wonders if these tanks served with our troops in either PNG or Borneo as they were already long-in-the-tooth models at war’s end. What tales could they tell? Editor's note: I hope to expand on this story as new material comes to light, so please check back occasionally. If you have information to add, please leave a comment. If you ever stop by the little town, pop into the museum and say 'hi' to curator, John Heintze.